For anyone who is looking for a Christmas present for The Homeshoppingista, Jay King’s gorgeous turquoise bowls are available online on HSN.com for $400. These bowls usually fly out the door, as they say in retail. Each bowl takes one day to sculpt, carve and polish. They are actual;y made of a composite of turquoise gibbsite, feldspar, quartz and titanium dioxide. But don’t serve your Thanksgiving stuffing out of this Mine Fine. “This Jay King Sculptured Bowl is for decorative purposes only and is not intended for food use,” HSN.com warns. HSN rock god Jay King, on his recent appearance on the home shopping channel, said that his turquoise and lapis bowls might be back in October. But his own company in Albuquerque, Desert Rose Trading, has some of the bowls for sale right now on its website. 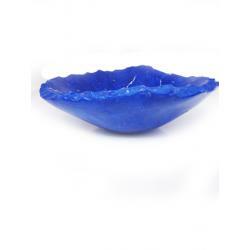 The lapis bowl is $399. HSN rock star Jay King’s current turquoise and lapis bowls are not long for this world. King, who has HSN’s Today’s Special Wednesday, said on his first show at midnight that he will have some of the popular bowls coming in October. “After that, I don’t know if we’ll be able to do it anymore,” King said. King was asked about the bowls again at 1 p.m., from a woman who wanted to buy one for her husband’s birthday. That time, King hedged a bit and said he was “trying” to bring the bowls back in October, again citing skyrocketing turquoise prices as the problem. “The turquoise had gone through the roof,” he told that caller. But take heart. King, who just came back from being on the road for five weeks, also mentioned that he has just designed four more bowls. So maybe we’ll see them coming up on HSN. Wednesday is HSN’s 24-hour Silver Celebration, and King’s TS is a garnet waterfall necklace for $100. 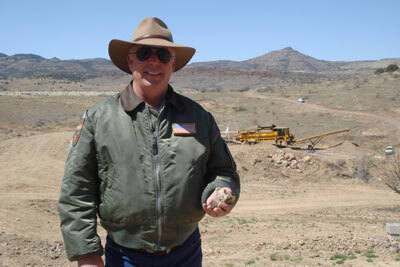 Marty Colbaugh, the owner of the Kingman Mine in Arizona, doesn’t play favorites in terms of which home shopping network he sells his turquoise to. QVC’s Today’s Special Value Saturday is a blue Kingman turquoise necklance and enhancer made from Kingman turquoise that was found in a huge vein in the mine last year. So Colbaugh is appearing in on-air promos on QVC and on videos on the network’s website. But Colbaugh is also a business associate and friend of Jay King, who does the Mine Finds line for QVC rival HSN. Just over a month ago, Colbaugh appeared live on HSN with King when the Today’s Special was a Kingman turquoise ring. The blue Kingman turquoise used for both pieces is apparently from the same “find” last year, and there has not been such a turquoise score at the Arizona mine since the late 1960s or early 1970s, Colbaugh said on both HSN and one of his QVC videos. When QVC host Jill Bauer said that the Today’s Special Valyue was manufactured in Albuquerque, N.M., we almost jumped out of our chair, because that’s where King’s factory is. But of course he is not making the QVC necklace. Veteran QVC Southwestern jewelry vendor Carolyn Pollack, who like King is based in Albuquerque, is making it. Rock god Jay King has been on HSN all this weekend with his Mine Finds from the Tucson Gem Show, and he gave an update Saturday night about his popular turquoise bowls and lapiz bowls. King told viewers that his lapiz bowls will be back on HSN in May, and that he’ll have 200 to sell. But the news as the turquoise bowls was not so great. It doesn’t look like we can expect them anytime soon. King, who travels the globe looking for unusual stones to craft into jewelry, said the turquoise bowls use a lot of “rough,” as they say in the rock biz. As a tease, King had one of his lapiz bowls sitting on the table as he did his HSN presentations. King has HSN’s Today’s Special Sunday. It is a pair of turquoise inlay interchangeable earrings, which have turquoise, mother of pearl and black enhancer that you can change out on the earrings. The earrings are $90. Jay King, HSN’s rock star, Monday night said he hopes to be bringing lapis bowls to the home shopping network in February. King, who travels around the world to find unusual stones to bring to HSN as his “Mine Finds,” was on the home shopping channel all weekend, with the Today’s Special, a turquoise and opal necklace, on Monday. One of King’s newest and most popular items have been turquoise bowls, a small one and a large one. The items, with the small 8 1/2-inch bowl costing $310, have quickly sold out. King, who HSN describes as its own Indiana Jones, said one of the issues in getting the turquoise bowls back is that they are using more stone rough than King and his crew had anticipated. HSN’s resident rock hound is Jay King, who travels around the world to scout for unusual “rough” to use for his Mine Finds jewelry, which is sold on the home shopping channel. King earlier this fall introduced bowls made out of turquoise, which flew out the door. They were quick sellouts. 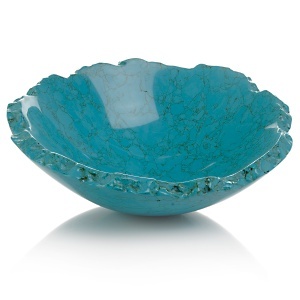 Well, an 8 1/2-inch version of King’s turquoise bowl is now available on HSN’s Web site. It’s $310, and apparentlly modeled after Navaho corn-grinding bowls. By the way, the bowls are described as “sculptured,” not turquoise. Carol Brodie, formerly of high-end gem house Harry Winston, is now doing a fine jewelry line called Rarities for HSN. The sophisticated and chatty blonde usually uses gemstones and diamonds in her pieces. But Saturday turquoise lovers were in for a treat when Brodie presented rings, pendants and earrings made out of a special new find — Crown Spring turquoise. This is something we would expect from HSN rock god Jay King, not Manhattanite Brodie. She said she had purchased all the rough for this new turquoise, which came out of the Kingman Mine in northwest Arizona. We’ve been to Arizona dozens of times, and have seen thousands of pieces of turquoise jewelry, but we have never seen anything like this Crown Spring turquoise. 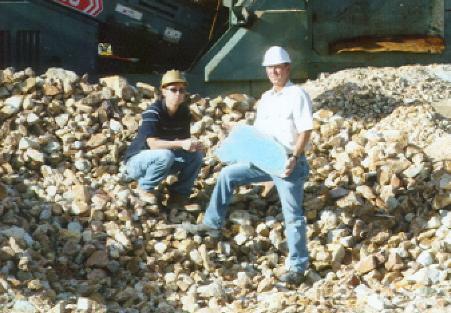 It was not robin’s egg blue, like some turquoise, or neon bright like Sleeping Beauty turquoise, which comes from the mine of the same name in Globe, Ariz. (where we have been). The Crown Spring turquoise was mottled, patterned, with bronze-colored matrix. “This turquoise has nature’s fingerprint all over it,” said Brodie, who wore shiny black leggings. It reminded us of a blue version of Carico Lake turquoise, which is a bright sage green, with matrix. It’s mined in Nevada. Brodie’s unique Crown Spring turquoise didn’t come cheap. The pieces, set in gold, ranged in price from $300 to $1,240 for one ring, which sold out at that high price. That ring not only had the Crown Spring turquoise but white and brown diamonds, and yellow, green, orange and blue sapphires. On HSN Jay King’s large turquoise bowls were such a hit that they sold out Saturday. We couldn’t even find them on the home shopping channel’s Web site. But King said that he will have 500 smaller turquoise bowls coming to HSN in November. He also had a bowl made of gorgeous blue lapiz on display during one of his afternoon shows, but there was no word about when that will be available. King has the Today’s Special coming up for Sunday. You are currently browsing the archives for the Jay King category.